A generous donor has contributed funds to construct a replica of the historic Fourth Order Fresnel lens, and we are planning to install it in the lantern room. However, there are expenses associated with installation and wiring. Help us make the dream come true and see the St. Marks Lighthouse once again light the coast. As many of you may know, the light from the Fresnel lens was extinguished in 2000 when the Coast Guard installed a modern solar powered light on the exterior of the lantern room. That light has since been removed, and the lighthouse has stood dark ever since. Bringing back the light has been the dream of many Refuge supporters. If you want to see this historic lighthouse once again beam its message to sea, please contribute to the Lighthouse Fund by donating online (scroll to the lighthouse choice) or by mail to Friends of St. Marks Wildlife Refuge, PO Box 368, St. Marks, FL 32355. The Wakulla County Historical Society’s program on Tuesday, January 8, 7:00 p.m. at the Wakulla County Public Library will feature Bill Gauger with a presentation on The Battle of Newport. The Civil War Battle of Natural Bridge March 6th, 1865, at the present day town of Woodville, southeast of Tallahassee, is commemorated by the Natural Bridge Battlefield State Park containing appropriate monuments, and hosts an annual reenactment. Preceding, overlapping, and extending after the battle, events at Newport on the St Marks River helped determine the Confederate victory. Our speaker, Bill Gauger, will tell us about the little-known, but important role Newport played in the ill-fated Union attempt to invade this part of Florida as the Civil War neared its end. 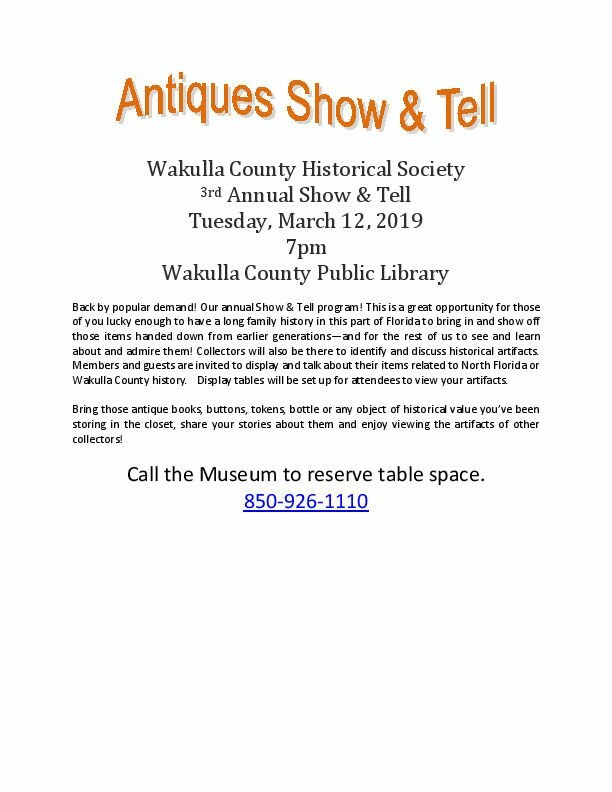 Bill is a member of the WCHS and participated in our annual Show and Tell program last March showing a Dr. Caldwell’s Pepsin medicine bottle he found in the Ochlockonee River and sharing the story of this company. He and his wife Maryann currently reside in Morehead City, NC, and enjoy spending their winters in their 5th wheel here in the Panhandle. He and Maryann both took early retirement from the Lee County, FL school system in 1999. Bill's interest in history, particularly Civil War history, goes back to childhood. He has an extensive Civil War library, collects Civil War artifacts, and has visited most of the major battlefields in the east. He enjoys researching lesser-known Civil War actions. 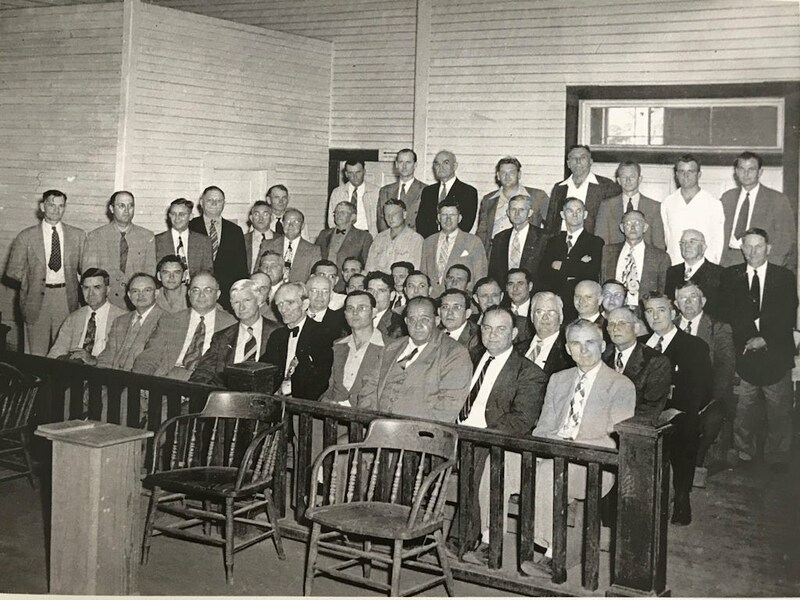 The Wakulla County Historical Society program on Tuesday, November 13, 7:00 PM, will be held at the Wakulla County Public Library, 4330 Crawfordville Hwy. The presentation led by John Y. Roberts will feature a panel of lifelong residents of the historic village of St. Marks who will share their memories of life there as well as talk about life there today. You will also get a condensed version of the colorful history of St. Marks, from the home of the Apalachee Indians and the arrival in the area of the Spanish expedition of Panfilo de Narvaez in 1528. Because of its strategic location at the confluence of the St. Marks and Wakulla Rivers, the Spanish constructed a fort at that location, Fort San Marcos de Apalache, in 1679. During their periods of occupation, the flags of Spain, England, America, and the Confederacy flew over the fort until 1865. Admission is free and open to the public, and we believe all who attend will enjoy the program and come away with an appreciation for the little village of St. Marks situated on the beautiful St. Marks River. For more information, please call the Historical Society at (850) 926-1110. We look forward to seeing you there.